“The Devil Wears Prado” (Credit: Detroit Skinny). 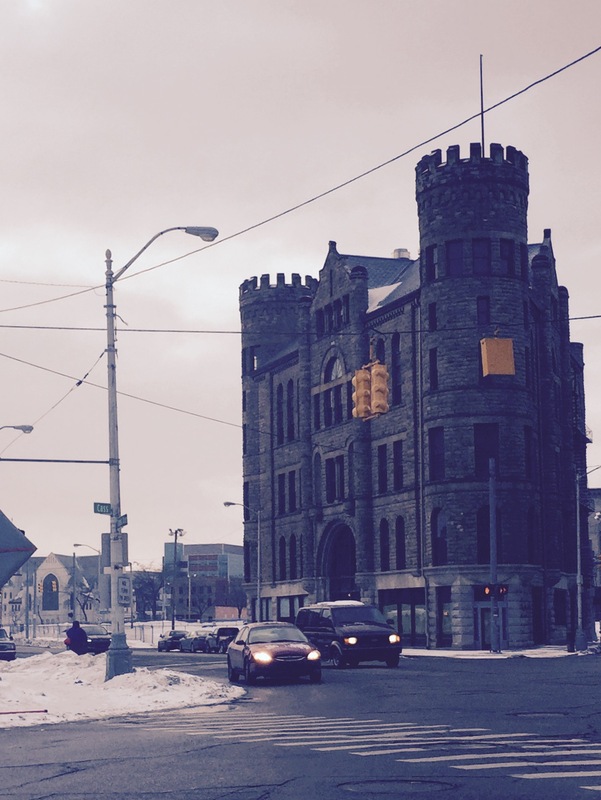 If you’ve driven down Grand River in Detroit, you might’ve looked up and wondered what in the heck a castle is doing in the middle of downtown. More on that later. For now, I’m so excited that one of Detroit’s coolest buildings, the GAR Detroit, welcomed its first visitors last week after sitting empty for more than 30 years. Today, the GAR building is home to one of Detroit’s newest restaurants, Republic. The restaurant is touted as an “old world European tavern” with a focus on local and seasonal items. 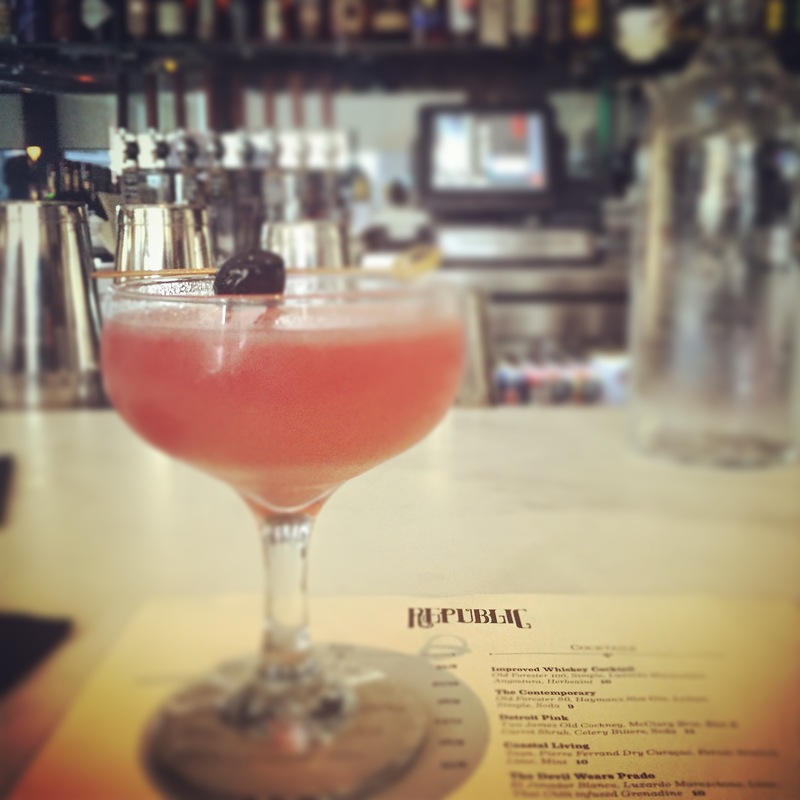 I stopped by Republic with coworkers for a quick happy hour last week and was definitely impressed. It was so cool to see the place packed on a Thursday evening, less than a week after officially opening its doors. Everything about the experience at Republic seemed carefully crafted. Aside from the totally classy interior, the food and drinks had their own artistic flair. We shared several menu items between our group, including the Ploughman’s Platter (sampler), the bone marrow fritters and the lamb loin. There wasn’t anything I tasted that I didn’t want more of! I really loved the bone marrow fritters which were fluffy, rich, buttery, goodness. My favorite cocktail was “The Devil Wears Prado,” featuring tequila with chili-infused grenadine. So delicious! Republic is located within the historic GAR Detroit building on Grand River downtown. (Credit: Detroit Skinny). I definitely want to go back again for full meal, including the Brown Bread Ice Cream that seems to be popular on Yelp. The skinny: Republic is a great place for a classier take on happy hour, dinner before the theater or a romantic date night (they currently open at 5pm). Although on the pricier side, it’s certainly not unreasonable for what you get. The GAR is a quick hop off of the Fisher Freeway and street parking is available. Oh right, about the castle part. The building gets its name from the Grand Army of the Republic, which according to the Library of Congress, was the “preeminent veterans’ organization formed at the close of the Civil War.” The building was a center for GAR meetings and veterans’ activities. You can learn more about the history of the GAR building from Historic Detroit or take a peek inside the renovation process (and other coming attractions within the building!) by following the GAR Detroit blog. Have you been to Republic? What’s your favorite dish or drink on the menu? Categories: Bites and Brews | Tags: downtown | Permalink.